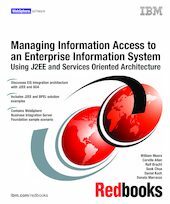 This IBM Redbooks publication focuses on issues associated with the integration of an existing enterprise information system (EIS) into a new Java 2 Platform, Enterprise Edition (J2EE), and other service-oriented applications. The book specifically discusses quality of service issues that are associated with the integration of geographically remote EIS. It describes how to use Web services, Java Message Service (JMS), and J2EE Connector Architecture (JCA) technologies in combination to enable access to existing transactions while addressing transport difficulties due to variable network conditions. It also addresses security context and transaction context propagation issues. The audience for this book is architects and developers who are implementing new J2EE and service oriented architecture (SOA) solutions that need to be integrated with existing EIS systems.